What specialists treat lung cancer? How do health care professionals diagnose lung cancer? How do health care professionals determine lung cancer staging? What is the prognosis and life expectancy of lung cancer? Is it possible to prevent lung cancer? Cigarette smoking is the principal risk factor for development of lung cancer. Passive exposure to tobacco smoke (passive smoking) also can cause lung cancer. The two types of lung cancer, which grow and spread differently, are small cell lung cancers (SCLC) and non-small cell lung cancers (NSCLC). 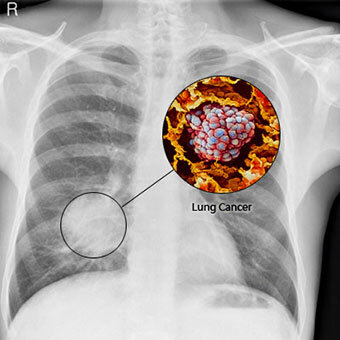 The stage of lung cancer refers to the extent to which the cancer has spread in the body. The general prognosis of lung cancer is poor because doctors tend not to find the disease until it is at an advanced stage. Five-year survival is around 54% for early stage lung cancer that is localized to the lungs, but only around 4% in advanced, inoperable lung cancer. Smoking cessation is the most important measure that can prevent the development of lung cancer. Tumors can be benign or malignant; when we speak of "cancer," we are referring to those tumors that are malignant. Benign tumors usually can be removed and do not spread to other parts of the body. Malignant tumors, on the other hand, often grow aggressively locally where they start, but tumor cells also can enter into the bloodstream or lymphatic system and then spread to other sites in the body. This process of spread is termed metastasis; the areas of tumor growth at these distant sites are called metastases. Since lung cancer tends to spread or metastasize very early after it forms, it is a very life-threatening cancer and one of the most difficult cancers to treat. While lung cancer can spread to any organ in the body, certain locations -- particularly the adrenal glands, liver, brain, and bones -- are the most common sites for lung cancer metastasis. The lung also is a very common site for metastasis from malignant tumors in other parts of the body. Tumor metastases are made up of the same types of cells as the original (primary) tumor. For example, if prostate cancer spreads via the bloodstream to the lungs, it is metastatic prostate cancer in the lung and is not lung cancer. 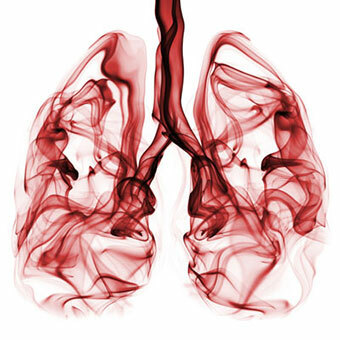 The principal function of the lungs is to exchange gases between the air we breathe and the blood. Through the lung, carbon dioxide is removed from the bloodstream and oxygen enters the bloodstream. The right lung has three lobes, while the left lung is divided into two lobes and a small structure called the lingula that is the equivalent of the middle lobe on the right. The major airways entering the lungs are the bronchi, which arise from the trachea, which is outside the lungs. The bronchi branch into progressively smaller airways called bronchioles that end in tiny sacs known as alveoli where gas exchange occurs. The lungs and chest wall are covered with a thin layer of tissue called the pleura. Lung cancers can arise in any part of the lung, but 90%-95% of cancers of the lung are thought to arise from the epithelial cells, the cells lining the larger and smaller airways (bronchi and bronchioles); for this reason, lung cancers are sometimes called bronchogenic cancers or bronchogenic carcinomas. (Carcinoma is another term for cancer.) Cancers also can arise from the pleura (called mesotheliomas) or rarely from supporting tissues within the lungs, for example, the blood vessels. 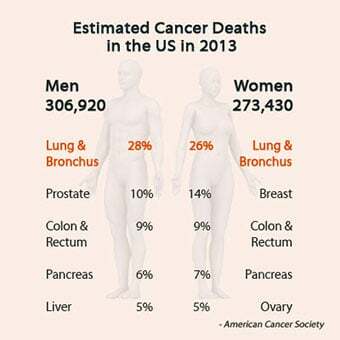 Lung cancer is the most common cause of death due to cancer in both men and women throughout the world. Statistics from the American Cancer Society estimated that in 2018 there will be about 244,000 new cases of lung cancer in the U.S. occurred and over 154,000 deaths were due to the disease. According to the U.S. National Cancer Institute, approximately 6.5% of men and women in the U.S. will be diagnosed with cancer of the lung at some point in their lifetime based on data from 2011-13. Lung cancer is predominantly a disease of the elderly; almost 70% of people diagnosed with lung cancer are over 65 years of age, while less than 3% of lung cancers occur in people under 45 years of age. The median age at diagnosis is 70 years. Passive smoking or the inhalation of tobacco smoke by nonsmokers who share living or working quarters with smokers, also is an established risk factor for the development of lung cancer. Research has shown that nonsmokers who reside with a smoker have a 24% increase in risk for developing lung cancer when compared with nonsmokers who do not reside with a smoker. The risk appears to increase with the degree of exposure (number of years exposed and number of cigarettes smoked by the household partner) to secondhand smoke. It is estimated that over 7,000 lung cancer deaths occur each year in the U.S. that are attributable to passive smoking. Asbestos fibers are silicate fibers that can persist for a lifetime in lung tissue following exposure to asbestos. The workplace was a common source of exposure to asbestos fibers, as asbestos was widely used in the past as both thermal and acoustic insulation. Today, asbestos use is limited or banned in many countries, including the U.S. Both lung cancer and mesothelioma (cancer of the pleura of the lung as well as of the lining of the abdominal cavity called the peritoneum) are associated with exposure to asbestos. Cigarette smoking drastically increases the chance of developing an asbestos-related lung cancer in workers exposed to asbestos; asbestos workers who do not smoke have a fivefold greater risk of developing lung cancer than nonsmokers, but asbestos workers who smoke have a risk that is fifty- to ninety-fold greater than nonsmokers. Radon gas is a natural radioactive gas that is a natural decay product of uranium that emits a type of ionizing radiation. Radon gas is a known cause of lung cancer, with an estimated 12% of lung cancer deaths attributable to radon gas, or about 21,000 lung-cancer-related deaths annually in the U.S., making radon the second leading cause of lung cancer in the U.S. after smoking. As with asbestos exposure, concomitant smoking greatly increases the risk of lung cancer with radon exposure. Radon gas can travel up through soil and enter homes through gaps in the foundation, pipes, drains, or other openings. The U.S. Environmental Protection Agency estimates that one out of every 15 homes in the U.S. contains dangerous levels of radon gas. 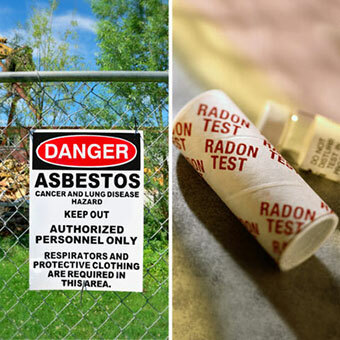 Radon gas is invisible and odorless, but it can be detected with simple test kits. While the majority of lung cancers are associated with tobacco smoking, the fact that not all smokers eventually develop lung cancer suggests that other factors, such as individual genetic susceptibility, may play a role in the causation of lung cancer. Numerous studies have shown that lung cancer is more likely to occur in both smoking and nonsmoking relatives of those who have had lung cancer than in the general population. It is unclear how much of this risk is due to shared environmental factors (like a smoking household) and how much is related to genetic risk. People who inherit certain genes, like genes that interfere with DNA repair, may be at greater risk for several types of cancer. Tests to identify people at increased genetic risk of lung cancer are not yet available for routine use. Survivors of lung cancer have a greater risk of developing a second lung cancer than the general population has of developing a first lung cancer. 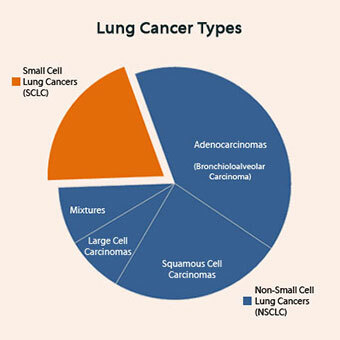 Survivors of non-small cell lung cancers (NSCLCs, see below) have an additive risk of 1%-2% per year for developing a second lung cancer. In survivors of small cell lung cancers (SCLCs, see below), the risk for development of second lung cancers approaches 6% per year. Air pollution from vehicles, industry, and power plants can raise the likelihood of developing lung cancer in exposed individuals. Up to 1%-2% of lung cancer deaths are attributable to breathing polluted air, and experts believe that prolonged exposure to highly polluted air can carry a risk for the development of lung cancer similar to that of passive smoking. 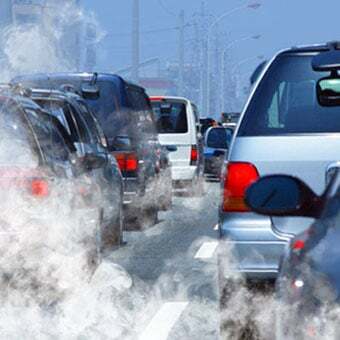 Exhaust from diesel engines is made up of gases and soot (particulate matter). Many occupations, such as truck drivers, toll booth workers, forklift and other heavy machinery operators, railroad and dock workers, miners, garage workers and mechanics, and some farm workers are frequently exposed to diesel exhaust. Studies of workers exposed to diesel exhaust have shown a small but significant increase in the risk of developing lung cancer. 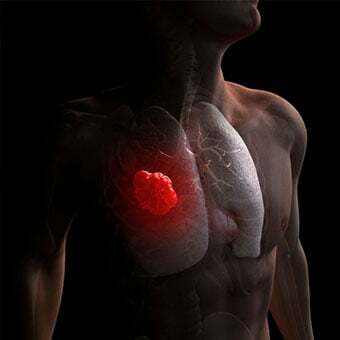 Lung cancers, also known as bronchogenic carcinomas because they arise from the bronchi within the lungs, are broadly classified into two types: small cell lung cancers (SCLC) and non-small cell lung cancers (NSCLC). This classification is based upon the microscopic appearance of the tumor cells themselves, specifically the size of the cells. These two types of cancers grow and spread in different ways and may have different treatment options, so a distinction between these two types is important. Adenocarcinomas are the most commonly seen type of NSCLC in the U.S. and comprise up to 50% of NSCLC. While adenocarcinomas are associated with smoking like other lung cancers, this type is observed as well in nonsmokers who develop lung cancer. Most adenocarcinomas arise in the outer, or peripheral, areas of the lungs. Mixtures of different types of NSCLC also are seen. Bronchial carcinoids account for up to 5% of lung cancers. These tumors are sometimes referred to as lung neuroendocrine tumors. They are generally small (3 cm-4 cm or less) when diagnosed and occur most commonly in people under 40 years of age. Unrelated to cigarette smoking, carcinoid tumors can metastasize, and a small proportion of these tumors secrete hormone-like substances that may cause specific symptoms related to the hormone being produced. Carcinoids generally grow and spread more slowly than bronchogenic cancers, and many are detected early enough to be amenable to surgical resection. Symptoms related to the cancer: The growth of the cancer and invasion of lung tissues and surrounding tissue may interfere with breathing, leading to symptoms such as cough, shortness of breath, wheezing, chest pain, and coughing up blood (hemoptysis). If the cancer has invaded nerves, for example, it may cause shoulder pain that travels down the outside of the arm (called Pancoast syndrome) or paralysis of the vocal cords leading to hoarseness. Invasion of the esophagus may lead to difficulty swallowing (dysphagia). If a large airway is obstructed, collapse of a portion of the lung may occur and cause infections (abscesses, pneumonia) in the obstructed area. Nonspecific symptoms: Nonspecific symptoms seen with many cancers, including lung cancers, include weight loss, weakness, and fatigue. Psychological symptoms such as depression and mood changes also are common. The treatment of lung cancer requires a team approach. Surgical oncologists are surgeons specialized in the removal of cancers. Thoracic surgeons or general surgeons may also surgically treat lung cancers. Medical and radiation oncologists are specialists in the treatment of cancers with medications and radiation therapy, respectively. Other specialists who may be involved in the care of people with lung cancer include pain and palliative care specialists, as well as pulmonary specialists (medical pulmonologists). CT (computerized tomography) scans may be performed on the chest, abdomen, and/or brain to examine for both metastatic and lung tumors. CT scans are X-ray procedures that combine multiple images with the aid of a computer to generate cross-sectional views of the body. The images are taken by a large donut-shaped X-ray machine at different angles around the body. One advantage of CT scans is that they are more sensitive than standard chest X-rays in the detection of lung nodules, that is, they will demonstrate more nodules. Sometimes intravenous contrast material is given prior to the scan to help delineate the organs and their positions. The most common side effect is an adverse reaction to intravenous contrast material that may have been given prior to the procedure. This may result in itching, a rash, or hives that generally disappear rather quickly. Severe anaphylactic reactions (life-threatening allergic reactions with breathing difficulties) to the contrast material are rare. CT scans of the abdomen may identify metastatic cancer in the liver or adrenal glands, and CT scans of the head may be ordered to reveal the presence and extent of metastatic cancer in the brain. A technique called a low-dose helical CT scan (or spiral CT scan) is recommended by the USPSTF annually in current and former smokers between ages 55 and 80 with at least a 30 pack-year history of cigarette smoking who have smoked cigarettes within the past 15 years. The technique appears to increase the likelihood of detection of smaller, earlier, and more curable lung cancers. Three years of low-dose CT scanning in this group reduced the risk of lung cancer death by 20%. Use of models and rules for analyzing the results of these tests are decreasing the need for biopsy to evaluate detected nodules when the likelihood is high the nodule is not cancerous. Positron emission tomography (PET) scanning is a specialized imaging technique that uses short-lived radioactive drugs to produce three-dimensional colored images of those drugs in the tissues within the body. While CT scans and MRI scans look at anatomical structures, PET scans measure metabolic activity and the function of tissues. PET scans can determine whether a tumor tissue is actively growing and can aid in determining the type of cells within a particular tumor. In PET scanning, the patient receives a short half-lived radioactive drug, receiving approximately the amount of radiation exposure as two chest X-rays. The drug accumulates in certain tissues more than others, depending on the drug that is injected. The drug discharges particles known as positrons from whatever tissues take them up. As the positrons encounter electrons within the body, a reaction producing gamma rays occurs. A scanner records these gamma rays and maps the area where the radioactive drug has accumulated. For example, combining glucose (a common energy source in the body) with a radioactive substance will show where glucose is rapidly being used, for example, in a growing tumor. PET scanning may also be integrated with CT scanning in a technique known as PET-CT scanning. Integrated PET-CT has been shown to improve the accuracy of staging (see below) over PET scanning alone. Bronchoscopy: Examination of the airways by bronchoscopy (visualizing the airways through a thin, fiberoptic probe inserted through the nose or mouth) may reveal areas of tumor that can be sampled (biopsied) for diagnosis by a pathologist. A tumor in the central areas of the lung or arising from the larger airways is accessible to sampling using this technique. Bronchoscopy may be performed using a rigid or a flexible fiberoptic bronchoscope and can be performed in a same-day outpatient bronchoscopy suite, an operating room, or on a hospital ward. The procedure can be uncomfortable, and it requires sedation or anesthesia. While bronchoscopy is relatively safe, it must be carried out by a lung specialist (pulmonologist or surgeon) experienced in the procedure. When a tumor is visualized and adequately sampled, an accurate cancer diagnosis usually is possible. Some patients may cough up dark-brown blood for one to two days after the procedure. More serious but rare complications include a greater amount of bleeding, decreased levels of oxygen in the blood, and heart arrhythmias as well as complications from sedative medications and anesthesia. Needle biopsy: Fine-needle aspiration (FNA) through the skin, most commonly performed with radiological imaging for guidance, may be useful in retrieving cells for diagnosis from tumor nodules in the lungs. Needle biopsies are particularly useful when the lung tumor is peripherally located in the lung and not accessible to sampling by bronchoscopy. A small amount of local anesthetic is given prior to insertion of a thin needle through the chest wall into the abnormal area in the lung. Cells are suctioned into the syringe and are examined under the microscope for tumor cells. This procedure is generally accurate when the tissue from the affected area is adequately sampled, but in some cases, adjacent or uninvolved areas of the lung may be mistakenly sampled. A small risk (3%-5%) of an air leak from the lungs (called a pneumothorax, which can easily be treated) accompanies the procedure. Thoracentesis: Sometimes lung cancers involve the lining tissue of the lungs (pleura) and lead to an accumulation of fluid in the space between the lungs and chest wall (called a pleural effusion). Aspiration of a sample of this fluid with a thin needle (thoracentesis) may reveal the cancer cells and establish the diagnosis. As with the needle biopsy, a small risk of a pneumothorax is associated with this procedure. Major surgical procedures: If none of the aforementioned methods yields a diagnosis, surgical methods must be employed to obtain tumor tissue for diagnosis. These can include mediastinoscopy (examining the chest cavity between the lungs through a surgically inserted probe with biopsy of tumor masses or lymph nodes that may contain metastases) or thoracotomy (surgical opening of the chest wall for removal or biopsy of a tumor). With a thoracotomy, it is rare to be able to completely remove a lung cancer, and both mediastinoscopy and thoracotomy carry the risks of major surgical procedures (complications such as bleeding, infection, and risks from anesthesia and medications). These procedures are performed in an operating room, and the patient must be hospitalized. Blood tests: While routine blood tests alone cannot diagnose lung cancer, they may reveal biochemical or metabolic abnormalities in the body that accompany cancer. For example, elevated levels of calcium or of the enzyme alkaline phosphatase may accompany cancer that is metastatic to the bones. Likewise, elevated levels of certain enzymes normally present within liver cells, including aspartate aminotransferase (AST or SGOT) and alanine aminotransferase (ALT or SGPT), signal liver damage, possibly through the presence of tumor metastatic to the liver. One current focus of research in the area of lung cancer is the development of a blood test to aid in the diagnosis of lung cancer. Researchers have preliminary data that has identified specific proteins, or biomarkers, that are in the blood and may signal that lung cancer is present in someone with a suspicious area seen on a chest X-ray or other imaging study. Molecular testing: For advanced NSCLCs, molecular genetic testing is carried out to look for genetic mutations in the tumor. Mutations that are responsible for tumor growth are known as driver mutations. For example, testing may be done to look for mutations or abnormalities in the epithelial growth factor receptor (EGFR) and the anaplastic lymphoma kinase (ALK) genes. Other genes that may be mutated include MAPK and PIK3. Specific therapies are available that may be administered to patients whose tumors have these alterations in their genes. The stage of a cancer is a measure of the extent to which a cancer has spread in the body. Staging involves evaluation of a cancer's size and its penetration into surrounding tissue as well as the presence or absence of metastases in the lymph nodes or other organs. Staging is important for determining how a particular cancer should be treated, since lung cancer therapies are geared toward specific stages. Staging of a cancer also is critical in estimating the prognosis of a given patient, with higher-stage cancers generally having a worse prognosis than lower-stage cancers. 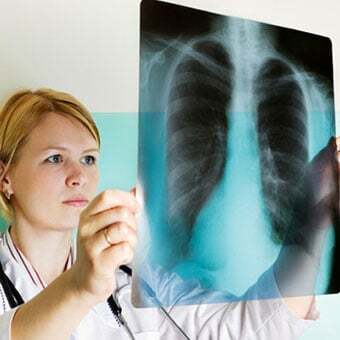 Doctors may use several tests to accurately stage a lung cancer, including laboratory (blood chemistry) tests, X-rays, CT scans, bone scans, MRI scans, and PET scans. 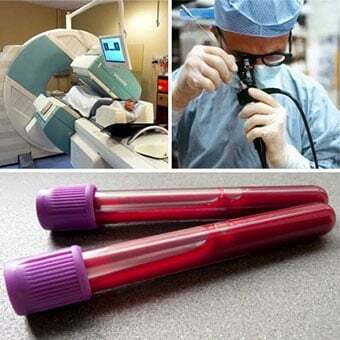 Abnormal blood chemistry tests may signal the presence of metastases in bone or liver, and radiological procedures can document the size of a cancer as well as its spread. Treatment for lung cancer primarily involves surgical removal of the cancer, chemotherapy, or radiation therapy, as well as combinations of these treatments. Targeted therapies and immunotherapy are becoming more common, as well. The decision about which treatments will be appropriate for a given individual must take into account the location and extent of the tumor, as well as the overall health status of the patient. Surgery: Surgical removal of the tumor is generally performed for limited-stage (stage I or sometimes stage II) NSCLC and is the treatment of choice for cancer that has not spread beyond the lung. About 10%-35% of lung cancers can be removed surgically, but removal does not always result in a cure, since the tumors may already have spread and can recur at a later time. Among people who have an isolated, slow-growing lung cancer removed, 25%-40% are still alive five years after diagnosis. 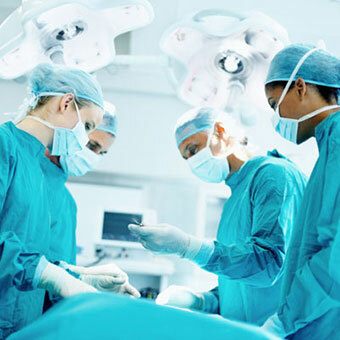 It is important to note that although a tumor may be anatomically suitable for resection, surgery may not be possible if the person has other serious conditions (such as severe heart or lung disease) that would limit their ability to survive an operation. Surgery is less often performed with SCLC than with NSCLC because these tumors are less likely to be localized to one area that can be removed. Radiation: Radiation therapy may be employed as a treatment for both NSCLC and SCLC. Radiation therapy uses high-energy X-rays or other types of radiation to kill dividing cancer cells. Radiation therapy may be given as curative therapy, palliative therapy (using lower doses of radiation than with curative therapy), or as adjuvant therapy in combination with surgery or chemotherapy. The radiation is either delivered externally, by using a machine that directs radiation toward the cancer, or internally through placement of radioactive substances in sealed containers within the area of the body where the tumor is localized. Brachytherapy is a term used to describe the use of a small pellet of radioactive material placed directly into the cancer or into the airway next to the cancer. This is usually done through a bronchoscope. 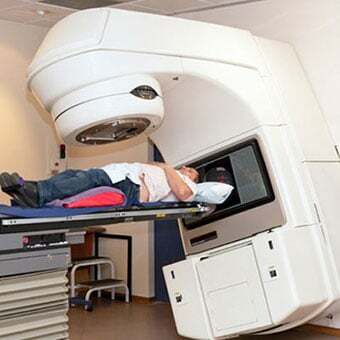 Radiation therapy can be given if a person refuses surgery, if a tumor has spread to areas such as the lymph nodes or trachea making surgical removal impossible, or if a person has other conditions that make them too ill to undergo major surgery. Radiation therapy generally only shrinks a tumor or limits its growth when given as a sole therapy, yet in 10%-15% of people it leads to long-term remission and palliation of the cancer. Combining radiation therapy with chemotherapy can further prolong survival when chemotherapy is administered. A person who has severe lung disease in addition to a lung cancer may not be able to receive radiotherapy to the lung since the radiation can further decrease function of the lungs. A type of external radiation therapy called the "gamma knife" is sometimes used to treat single brain metastases. In this procedure, multiple beams of radiation coming from different directions are focused on the tumor over a few minutes to hours while the head is held in place by a rigid frame. This reduces the dose of radiation that is received by noncancerous tissues. For external radiation therapy, a process called simulation is necessary prior to treatment. Using CT scans, computers, and precise measurements, simulation maps out the exact location where the radiation will be delivered, called the treatment field or port. This process usually takes 30 minutes to two hours. The external radiation treatment itself generally is done four or five days a week for several weeks. SCLC often spreads to the brain. Sometimes people with SCLC that is responding well to treatment are treated with radiation therapy to the head to treat very early spread to the brain (called micrometastasis) that is not yet detectable with CT or MRI scans and has not yet produced symptoms. This is known as prophylactic brain radiation. Brain radiation therapy can cause short-term memory problems, fatigue, nausea, and other side effects. Chemotherapy is the treatment of choice for most SCLC, since these tumors are generally widespread in the body when they are diagnosed. 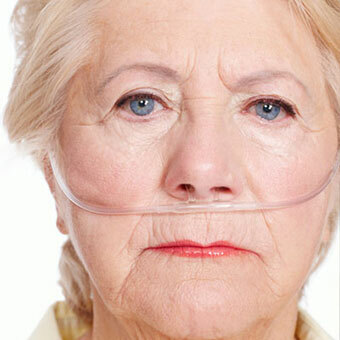 Only half of people who have SCLC survive for four months without chemotherapy. With chemotherapy, their survival time is increased up to four- to fivefold. Chemotherapy alone is not particularly effective in treating NSCLC, but when NSCLC has metastasized, it can prolong survival in many cases. Chemotherapy may be given as pills, as an intravenous infusion, or as a combination of the two. Chemotherapy treatments usually are given in an outpatient setting. A combination of drugs is given in a series of treatments, called cycles, over a period of weeks to months, with breaks in between cycles. Unfortunately, the drugs used in chemotherapy also kill normally dividing cells in the body, resulting in unpleasant side effects. Damage to blood cells can result in increased susceptibility to infections and difficulties with blood clotting (bleeding or bruising easily). Other side effects include fatigue, weight loss, hair loss, nausea, vomiting, diarrhea, and mouth sores. The side effects of chemotherapy vary according to the dosage and combination of drugs used and may also vary from individual to individual. 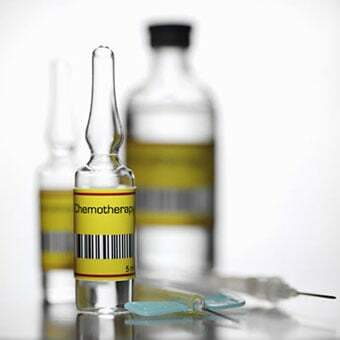 Medications have been developed that can treat or prevent many of the side effects of chemotherapy. The side effects generally disappear during the recovery phase of the treatment or after its completion. Targeted therapy: Molecularly targeted therapy involves the administration of drugs that have been identified to work in subsets of patients whose tumors have specific genetic changes (driver mutations) that promote tumor growth. EGFR-targeted therapies: The drugs erlotinib (Tarceva), afatinib (Gilotrif), and gefitinib (Iressa) are so-called targeted drugs that more specifically target cancer cells, resulting in less damage to normal cells than general chemotherapeutic agents. Erlotinib, gefitinib, and afatinib target a protein called the epidermal growth factor receptor (EGFR) that is important in promoting the division of cells. The gene encoding this protein is mutated in many cases of non-small cell lung cancer, creating a mutation that encourages tumor growth. Mutations in the EGFR gene are more common in cancers in women and in people who have never smoked. Drugs that target the EGFR receptor sometimes stop working after a time, which is known as resistance to the drug. Resistance often occurs because the cancer has developed a new mutation in the same gene, and a common example of this is the so-called EGFR T790M mutation. Some newer EGFR-targeted drugs also work against cells with the T790M mutation, including osimertinib (Tagrisso). Necitumumab (Portrazza) is another drug that targets EGFR. It can be used along with chemotherapy as the first treatment in people with advanced NSCLC of the squamous cell type. Other targeted therapies: Other targeted drugs are available that target other driver mutations. These other targeted therapies include the ALK tyrosine kinase inhibitor drugs crizotinib (Xalkori), alectinib (Alecensa), brigatinib (Alunbrig), and ceritinib (Zykadia) that are used in patients whose tumors have an abnormality of the ALK gene as the driver mutation. Some of these drugs may also be helpful for people whose cancers have an abnormality of the gene known as ROS1. The gene known as BRAF can also be abnormal in lung cancers causing the production of BRAF protein that promotes the cancer's growth. Dabrafenib (Tafinlar) is a type of drug known as a BRAF inhibitor and attacks the BRAF protein directly. Trametinib (Mekinist) is known as a MEK inhibitor because it attacks MEK proteins, which are related to BRAF proteins. These may be used for patients with tumors that have abnormal BRAF genes. Other attempts at targeted therapy include drugs known as antiangiogenesis drugs, which block the development of new blood vessels within a cancer. Without adequate blood vessels to supply oxygen-carrying blood, the cancer cells will die. The antiangiogenic drug bevacizumab (Avastin) has also been found to prolong survival in advanced lung cancer when it is added to the standard chemotherapy regimen. Bevacizumab is given intravenously every two to three weeks. However, since this drug may cause bleeding, it is not appropriate for use in patients who are coughing up blood, if the lung cancer has spread to the brain, or in people who are receiving anticoagulation therapy ("blood thinner" medications). Bevacizumab also is not used in cases of squamous cell cancer because it leads to bleeding from this type of lung cancer. Ramucirumab (Cyramza) is another angiogenesis inhibitor that can be used to treat advanced non-small cell lung cancer. Immunotherapy: Immunotherapy may be an effective option for some patients with advanced lung cancers. Immunotherapy drugs work by strengthening the activity of the immune system against tumor cells. The immunotherapy drugs nivolumab (Opdivo) and pembrolizumab (Keytruda) were approved by the U.S. FDA in 2015 for the treatment of lung cancer. These drugs are checkpoint inhibitors that target checkpoints or areas that control the immune response and promote the immune response. These two drugs target the PD-1 protein, which strengthens the immune response against the cancers. Atezolizumab (Tecentriq) is a drug that targets PD-L1, a protein related to PD-1 that is found on some tumor cells and immune cells. 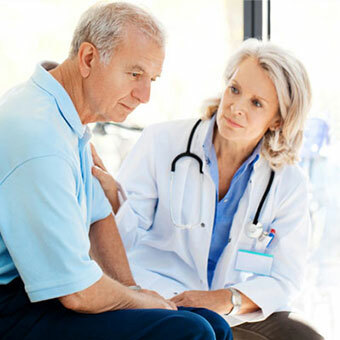 Radiofrequency ablation (RFA): Radiofrequency ablation is being studied as an alternative to surgery, particularly in cases of early stage lung cancer. In this type of treatment, a needle is inserted through the skin into the cancer, usually under guidance by CT scanning. Radiofrequency (electrical) energy is then transmitted to the tip of the needle where it produces heat in the tissues, killing the cancerous tissue and closing small blood vessels that supply the cancer. RFA usually is not painful and has been approved by the FDA for the treatment of certain cancers, including lung cancers. Studies have shown that this treatment can prolong survival similarly to surgery when used to treat early stages of lung cancer but without the risks of major surgery and the prolonged recovery time associated with major surgical procedures. Experimental therapies: Since no therapy is currently available that is absolutely effective in treating lung cancer, patients may be offered a number of new therapies that are still in the experimental stage, meaning that doctors do not yet have enough information to decide whether these therapies should become accepted forms of treatment for lung cancer. New drugs or new combinations of drugs are tested in so-called clinical trials, which are studies that evaluate the effectiveness of new medications in comparison with those treatments already in widespread use. Newer types of immunotherapy are being studied that involve the use of vaccine-related therapies that attempt to utilize the body's immune system to directly fight cancer cells. Lung cancer treatment vaccines are being studied in clinical trials. The prognosis of lung cancer refers to the chance for cure or prolongation of life (survival) and is dependent upon where the cancer is located, the size of the cancer, the presence of symptoms, the type of lung cancer, and the overall health status of the patient. In non-small cell lung cancer (NSCLC), the most important prognostic factor is the stage (extent of spread) of the tumor at the time of diagnosis. Results of standard treatment are generally poor in all but the smallest of cancers that can be surgically removed. However, in stage I cancers that can be completely removed surgically, five-year survival approaches 75%. Radiation therapy can produce a cure in a small minority of patients with NSCLC and leads to relief of symptoms in most patients. In advanced-stage disease, chemotherapy offers modest improvements in survival although rates of overall survival are poor. The overall prognosis for lung cancer is poor when compared with some other cancers. Survival rates for lung cancer are generally lower than those for most cancers, with an overall five-year survival rate for lung cancer of about 17% compared to 65% for colon cancer, 91% for breast cancer, 81% for bladder cancer, and over 99% for prostate cancer. Cessation of smoking and eliminating exposure to tobacco smoke is the most important measure that can prevent lung cancer. Many products, such as nicotine gum, nicotine sprays, or nicotine inhalers, may be helpful to people trying to quit smoking. Minimizing exposure to passive smoking also is an effective preventive measure. Using a home radon test kit can identify and allow correction of increased radon levels in the home. Methods that allow early detection of cancers, such as the helical low-dose CT scan, also may be of value in the identification of small cancers that can be cured by surgical resection and prevented from becoming widespread, incurable, metastatic cancer. American Cancer Society. "Lung Cancer." <http://www.cancer.org/cancer/lungcancer/>. American Lung Association. "Lung Cancer Fact Sheet." <http://www.lung.org/lung-health-and-diseases/lung-disease-lookup/lung-cancer/learn-about-lung-cancer/lung-cancer-fact-sheet.html>. United States. Centers for Disease Control and Prevention. "Lung Cancer." <http://www.cdc.gov/cancer/lung/>. United States. National Cancer Institute. "Lung Cancer." <http://www.cancer.gov/cancertopics/types/lung>.